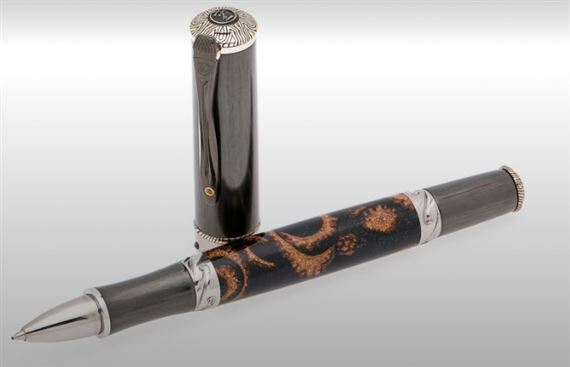 Order your William Henry RB8 Acorn Caps Cabernet Rollerball today from FahrneysPens.com. Fine Pens, Refills & Luxurious Gifts – great prices & fast shipping. The Cabernet 'Acorn' features an intricate barrel of acorn caps in black acrylic, and a light structure in aerospace grade titanium and aluminum. The accents on the carbon fiber cap are in mokume gane and titanium, and the pocket clip is set with a citrine gemstone. This writing instrument also features William Henry's patent-pending Wavelock™ cap closure system. This beautiful writing instrument also features William Henry's patent-pending Wavelock™ cap closure system – a ring of chromium steel balls embedded in a titanium ring which are captured in wave-shaped grooves in titanium collars for closed and post positions. The Cabernet 'Acorn' is a limited worldwide edition of 250 pieces, and the exotic barrel confers to each of them a distinct and original personality. Much like their owners, no two pens are ever alike. Each piece is engraved with the individual serial number inside the cap.